Dead Cells is a self-described rogue-lite, metroidvania action-platformer with 2D souls-lite combat. What?! There’s a lot of different phrases going on there, and if I had simply seen it appear described as such on the Steam Early Access lists, I might have passed over it. You see, my ‘rogue-like’ experience extends to Spelunky and the recently released Heat Signature, and the term ‘metroidvania’ went right over my head until Wikipedia pointed out the Batman: Arkham was an example. As for ‘souls-lite’ combat? I’ve never got along with the Souls games, while Bloodborne drew me in with its aesthetic, but put me off with its brutal difficulty. Dead Cells though? Joyous. You see, I was fortunate enough to play Dead Cells at EGX a few weeks ago. I’d regularly walked past the stand, pondering checking it out, but not overly enthused with waiting for a spot to open up. So, I wandered around and played some other games, until I eventually got to jump on it on day two of the show. As I said then, I was keen to check it out on Early Access once back home, and so, I have been. The different genre elements might sound a bit much, and some players will no doubt argue the merits over whether it is more of a metroidvania (or Castlevania) or rogue-like, but for me, it is a just fun to dip in and play away through a couple of attempted runs. You start off with your headless hero plopping down on the floor of some dingy castle, armed with a rusty sword and bow or shield, and let loose upon the monsters that inhabit the castle. Side scrolling away, you quickly pick up the rhythm of combat. Jump between floors, land with a smash, hit enemies with one of your two weapons (or shield), then use a skill for good measure. It’s fast paced and exciting, and of course, you know that you are going to die. But it’s fine, I’m enjoying the combat and exploring the procedurally generated levels enough that death isn’t too frustrating. Unless I’m dead because of my own stupidity….jumping into deadly spikes isn’t the smartest thing I’ve ever done. Killing the numerous enemies on your path rewards you with plentiful gold to spend at the merchant if you can find them hidden away, or to unlock various doors that tantaslisingly hint at great treasure. But….death will leave you penniless, unless you upgrade one of the many blueprints you will find on your adventures with cells that random enemies will leave for you. Some blueprints will confer an immediate, lasting bonus, such a purse which allows you to keep 3,000 gold coins after death. Others will unlock or upgrade weapons that you might then encounter on your journey, while some expensive blueprints will grant you a random weapon or shield from what you have unlocked at the start of the game. Oh, and by the way, you only get to cash in your cells or unlock a blueprint once you reach the end of a level. The master of your destiny…. It all makes for an enjoyable challenge, though whether I’ll be good enough to make it to the end boss without investing in all the upgrades, is yet to be seen. For now, I’m having fun, certainly looking forward to finding some new runes to access new areas, while I am determined to complete one of the secret challenge areas or cursed chests. 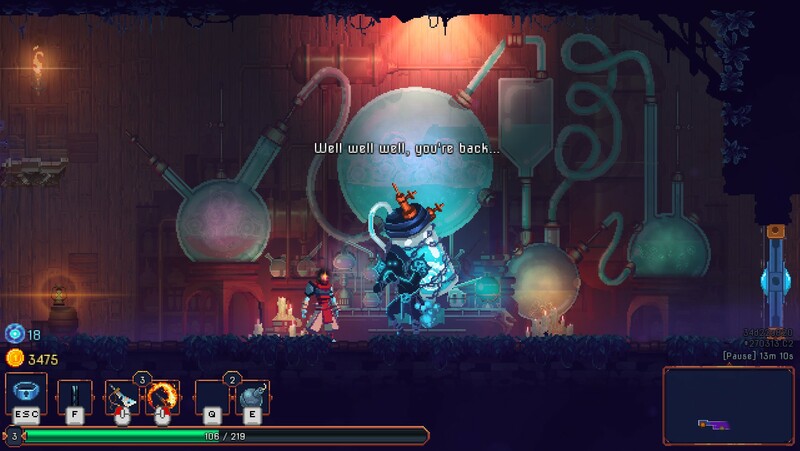 There is plenty going on in Dead Cells at the moment, and things should only get better as developers Motion Twin add ever more content during Early Access. For more, check out the official site or the game on Steam Early Access.